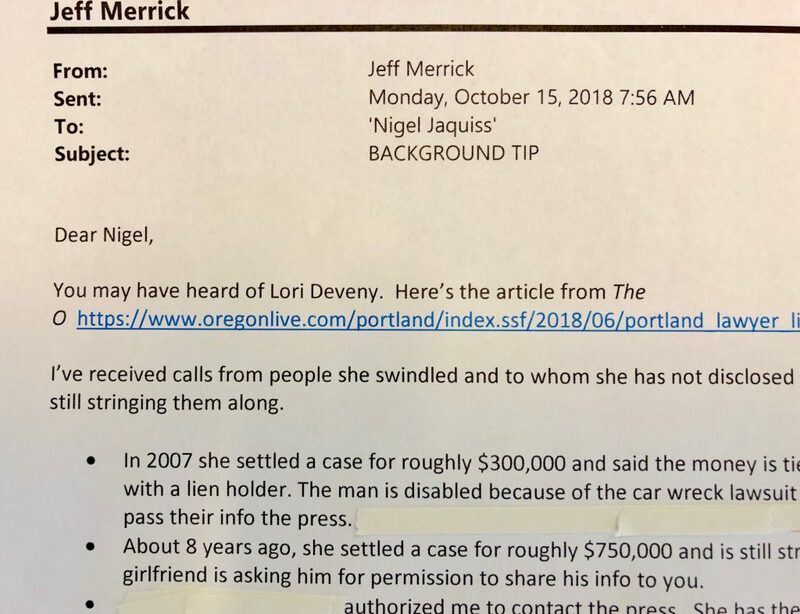 On October 15, 2018, I asked the Press for help alerting any other victims of Lori Deveny. People had contacted me to sue Ms. Deveny because I market myself to sue other lawyers. They told me she was still stringing them along with promises they would get their money, one day, as if she were still authorized to practice law. If anyone else were still waiting for money from Ms. Deveny, they needed to know her current status with the bar, I believed. I thought a lawsuit could be newsworthy and might alert others. I considered lawsuits alleging fraud, conversion, breach of fiduciary duty, legal malpractice or other claims. But, I did not feel it was in the best interests of the people who contacted me to file suit. Nevertheless, I believed I needed to something in case other people believed she was still acting as their lawyer. I contacted the Oregon State Bar, and I got the impression they felt they were doing all they could – which I did not believe was enough. So, I contacted Nigel Jaquiss to see if the Willamette Week might be interested in the story. Today, Ms. Del Savio and Willamette Week published their story on her. Thank you to Anna Del Savio, Nigel Jaquiss and the editors.